You wore shades to Latin class. You opened your locker and lots of stuff fell out. You MC-ed the greatest keg party in the whole of high school lore, and made sure that no angle was left unworked when it came to merchandising 'The Wolf'. You were the best Hawaiian-shirted friend that a discontented male lead in an 80s teen movie could possibly have, and were responsible for more copycat deaths by van-surfing than any other character in history. Alas, I know, deep down in my heart, that it can never be. I will never try to purchase beer with such flagrant audacity. I will never wear a blue shirt which simply reads, "Obnoxious". 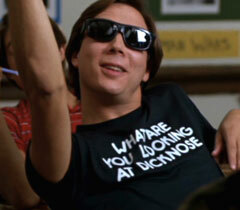 I will never carry off the phrase "WHAT ARE YOU LOOKING AT DICKNOSE" with quite as much aplomb. But I shall keep trying, Stiles; I shall keep trying. Because I will never, NEVER SAY DIE. PS - There's some imposter currently pretending to be you on MTV. Now would be a good time for a lawsuit.